In digital marketing, social media presence plays a key role. 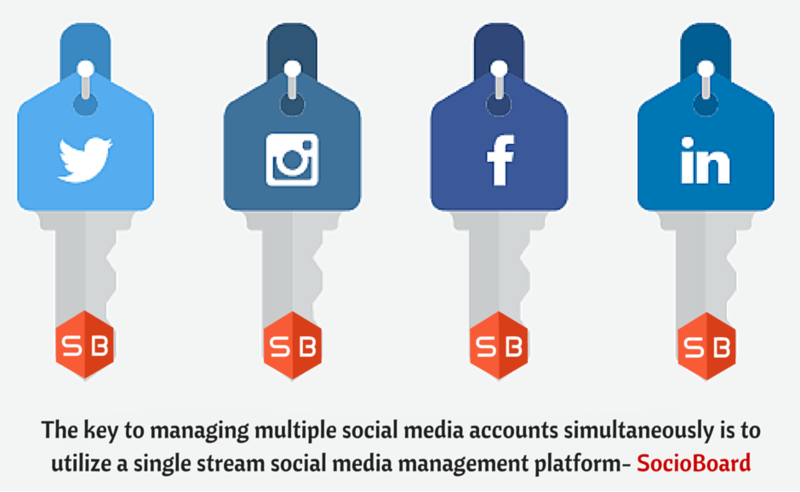 For businesses, it is very important to manage multiple social media accounts and monitor their activities. SocioBoard, the open-source social media lead generation toolkit makes all this work easier for digital marketers. Being an open source tool, it will likely come up with even more brilliant features in the near future. Starting from a free “basic” plan to an expert-level “platinum” plan, SocioBoard offers its services to many SMBs and entrepreneurs. 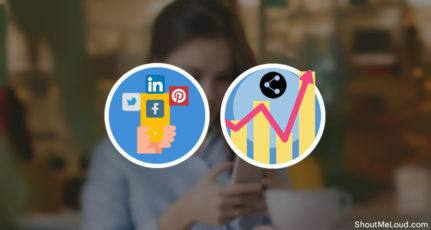 This beautiful tool suite offers flexible social media services and precise analytics to marketers and helps them with the growth of their business. 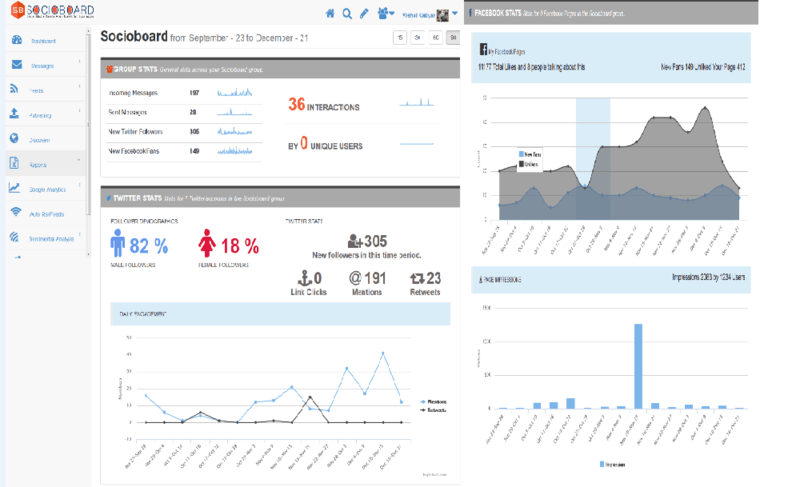 Let’s have a look at the overview of SocioBoard’s features that make social media lead generation simpler. 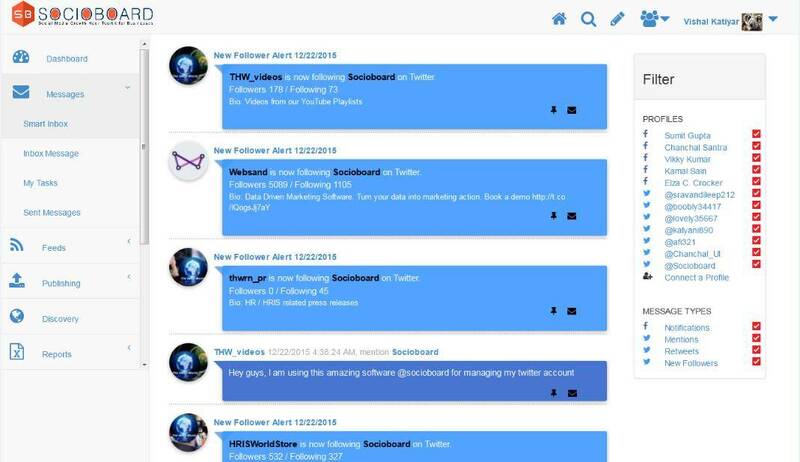 The features of SocioBoard meet the basic requirements of social media marketers. 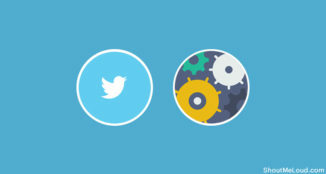 That is, marketers can manage multiple social accounts and automate their activities. 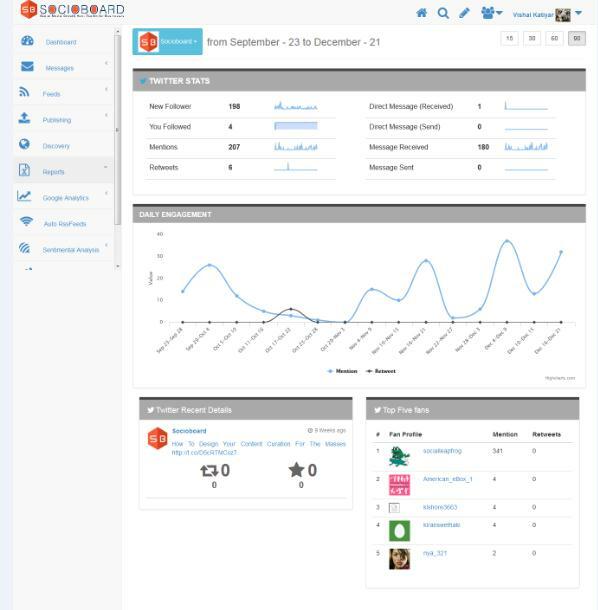 SocioBoard also offers additional features that can boost your social campaigns. There is also a filter on the right side of the dashboard. With this filter, you can select the already added social profiles and add some other accounts as well. With “Smart Inbox”, SocioBoard gives you an alert whenever an action is done on one of your social profiles. For example, when someone follows you on Twitter, you will get a message stating that someone started following you. You can get these messages for notifications, retweets, @mentions, and new followers. You can manage these messages and profiles in the filter. This is the normal inbox where you can see the direct messages you receive on various social media profiles. In the filter, you can select which social accounts to view/add new accounts. Working as a team is the driving factor of an organization. 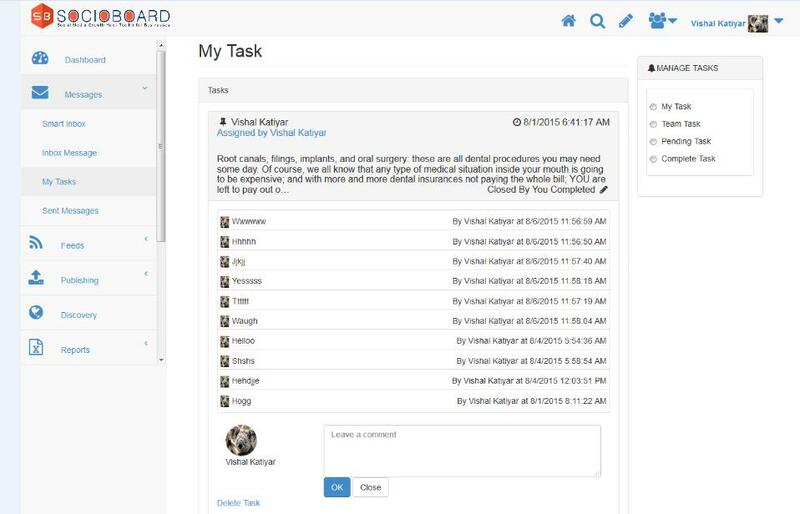 With the “My Tasks” feature, you can assign and schedule tasks to your team members. On the right side of the dashboard, you can see the “Manage Tasks” tool, where you can see “My Task”, “Team Task”, “Completed Task”, and “Pending Task”. This is helpful to see only the tasks you want to see on the dashboard for a specific social media account. This shows you all of the sent messages from the selected accounts. You can manage the accounts through the filter located on the right side of the dashboard. The drop-down list of this feature contains the list of all social networks that are supported (e.g. Facebook, Twitter, Instagram, etc.) Under each platform, you can see the accounts that were added. You can select an account and see the feed on the wall of that account. In the above pic, you can see that we’ve selected a Twitter account. So, the news feed and Tweets of that account are shown. Like this, you can see whatever feeds you want to see. The switching process is very simple. Publishing is an important part of social media marketing. You have to maintain good customer relations. You should do small things like wishing your customers a happy birthday or a happy (some other day). 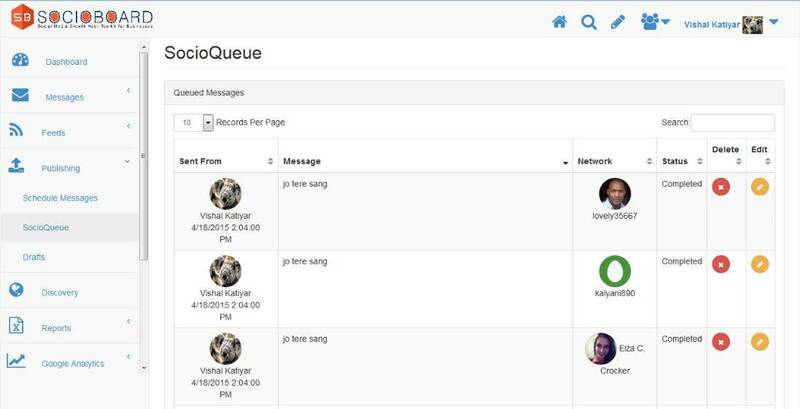 With this feature, you can schedule your messages and send them to multiple users at one time. It gives you a huge text space of 5000 characters, so you can compose a detailed message. On the top-right corner of the tab, you can select the social profiles to which you want to send the message. You can schedule the message now or you can save it to drafts and schedule it later. In the SocioQueue, you can see all of the messages that are scheduled. You can get complete details like the text of the message, who the message was scheduled to, and what the status is. You can search for messages using the search bar. If you want to delete or edit a message, you can easily do this from here. You can see the messages that are set as drafts by you. You can schedule them to be sent whenever you want. Marketers should always expand their social community. So searching for targeted users is an unavoidable task. With “Discovery”, you can search for users based on a keyword. SocioBoard enables you to make this search from a single window so you do not need to switch platforms. You can also see the search history. Here, you can make and refine the perfect search with different keywords. Measuring your social media performance is an important thing which enables you to come up with efficient strategies. 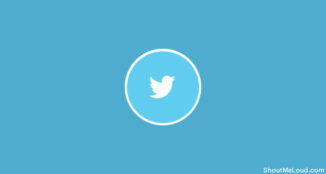 SocioBoard gives you deep insights into your social media activities. 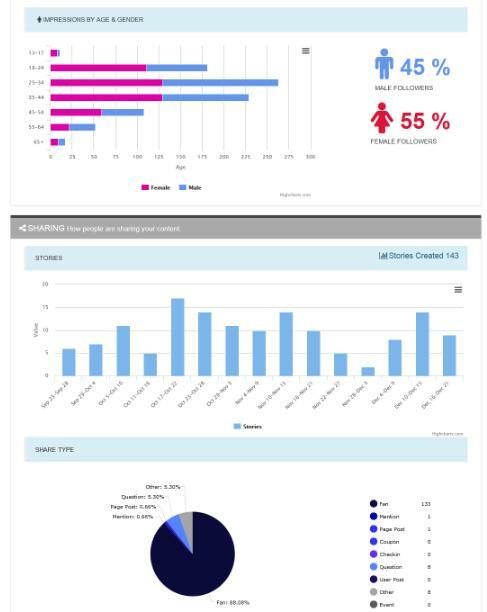 You can see individual reports like Facebook reports, Twitter reports, and combined group reports. In Facebook reports, you can see things like demographics of your followers, what kind of content works best for you, who is sharing your content, etc. With Twitter reports, you get to know the engagement stats, follower count, amount of new followers in a certain period of time, how many retweets you got, who your top five followers are, etc. Here, you can attach a link to a webpage (website/social media page) and fetch content from that link whenever a new post published. Then you can post it onto your selected social groups or pages. When you click on the “Actions” button, you can see the option for “Add Shareathon”. By clicking on it, you can add the source of the content. With this feature, you can post on multiple pages at a time. With this feature, you can post on multiple groups at a time. When you want to add the RSS feed of a website, you can make this process automated. With the “Automated RSS Feeds” feature of SocioBoard, you can automatically post the desired RSS feed on your desired social media accounts. As shown in the above pic, you can paste the URL for the RSS feed and then add in the social accounts that you want. Clicking on the “Add RSS Data” button, you can post the content on your selected profiles. With this feature, you can get to know the response of the social media users for your social pages. When someone mentions your name in their posts, or retweets your tweet, you can see the response of the users for that post. You can select the profiles and the type of the messages for which the sentiment analysis should be shown. Just like any other wallet, you can maintain cash and make purchases through SocioBoard’s E-Wallet. You can add money to the wallet by clicking on the “Add Money to Wallet” button. You can also receive from and send cash to others while ultimately transferring the wallet money to your bank account. This is a promotional feature of SocioBoard. You can invite your friends to join SocioBoard through an invitation link. When you click on the “Show Public URL” button on this feature’s dashboard, you can get the invitation link. By sending this link to your friends, you can invite them to join SocioBoard. But, what’s the benefit for you? Whenever a user joins through your link, you will be getting a commission sent to your wallet. Whenever they make a transaction on SocioBoard, there will be some extra commissions for you. 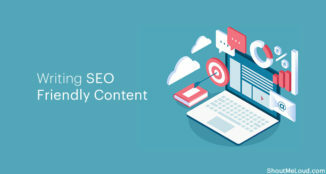 Generating quality and relevant content for social media accounts are important and usually, somewhat hectic. But with the BoardMe feature of SocioBoard, you can easily search for relevant content from a single dashboard. Hovering on the “Actions” button, you can see the “Add a Board” option. 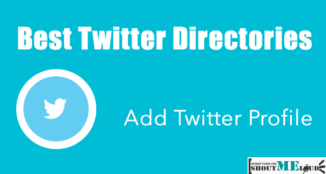 Clicking on it, you can create a board where you can add hashtags or names of social profiles. 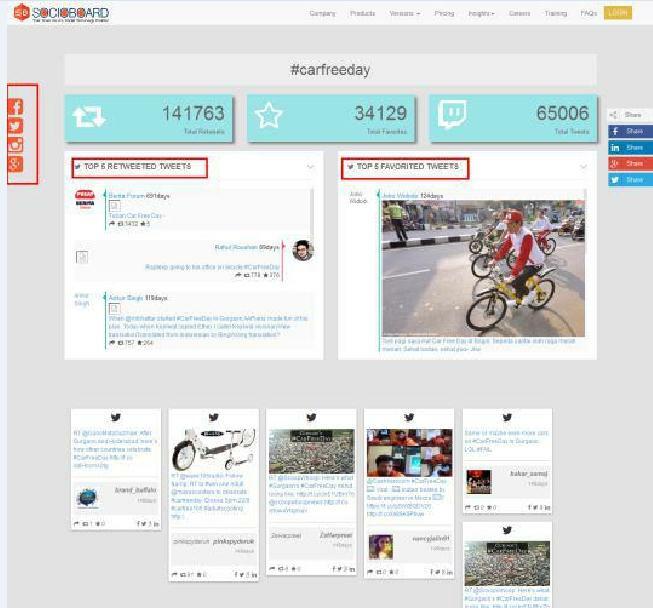 Once you add the board, you can get content from any social network or webpage in which the hashtag or name is used. The user interface of SocioBoard looks cool. The navigation of this tool is user-friendly. The main menu is located on the left-hand side of the dashboard. You can manage all of the essential things like Publishing, Messaging, Discovering, and Analyzing from a single window. The moment you log in, you can see the summary of all your social media accounts on the dashboard. From here, you can easily decide your next steps. For SMBs, the cost of a tool matters. But beyond the cost, they want good features as well. SocioBoard is the best choice for marketers who want better services at a better price. 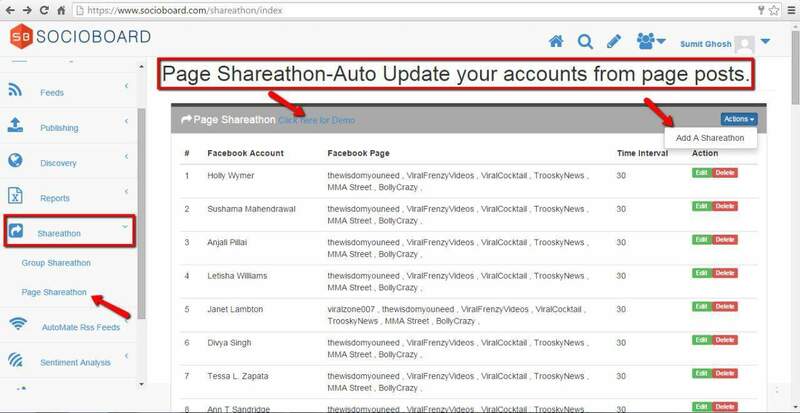 The new features of SocioBoard like Smart Inbox and Shareathon are the best-in-class features. Every minute is important for marketers and these features are very helpful in this regard. In any aspect, SocioBoard is a great choice for SMBs and entrepreneurs. Hello, Mates!!! I'm Sumit Ghosh, CEO of Socioboard Technologies and the Marketing Head of Socioboard. I'm responsible for the overall marketing strategy of SocioBoard, including product marketing, positioning, inbound demand generation and online marketing. Socioboard's new approach to open source social media management is changing how Social Media Marketing companies, digital agencies, corporations, and web/broadcast media across the world thinks about Socioboard. I also started the SocioBoard Blog to provide knowledge to new start-ups and entrepreneurs whose social marketing campaigns failed to generate ROI. Great article but I am confused so I want to ask you what I use my two facebook account with it? is this possible? @SUGANDHA, Yes you can use. Please try! Hi Sumit, Thanks for sharing on this promising utilitarian tool – Socioboard. I am still managing my social media manually and that is really not efficient. I was beginning to look for tols to help me manage all from all place. Glad to have found this post at this moment. Cheers. Hi Rupak, Thanks for the comment. Glad to hear that you liked the post. Please try Socioboard and share your experience with us. 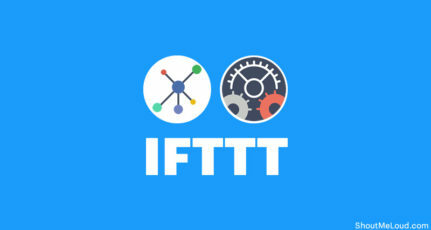 Another great tool, usually use Hootsuite for Twitter and this tools is definitely great. Thanks for reading and sharing your comment. 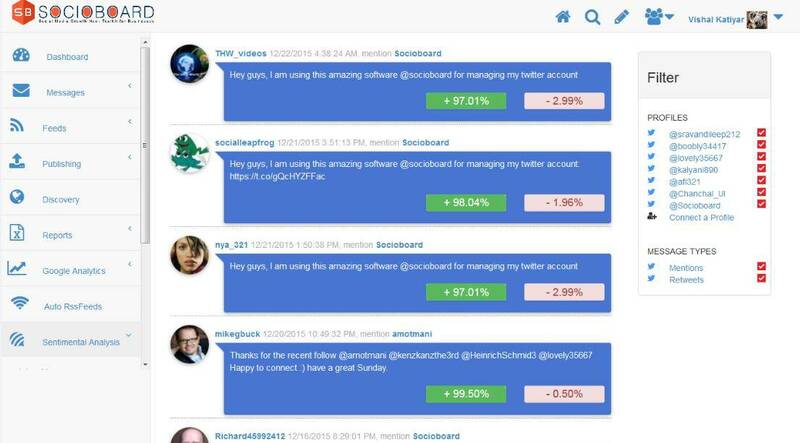 No doubt Hootsuite is a great social media management platform but Socioboard, all within one easy-to-use platform is one of the best alternatives in order to minimize the social media management cost. 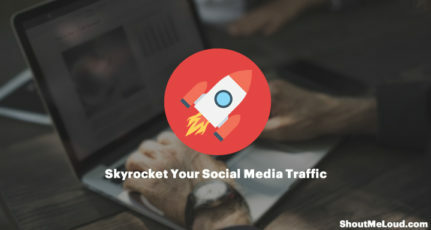 So, basically, Socioboard is the cost and time savvy Hootsuite alternative for social media marketers. Those who’re looking for Hootsuite alternatives Must Try!! !Hope you’ll like. Thank you Mr.Sumit for such a wonderful product. This is certainly helpful for me to score my blogging level to advanced level by improving social media engagement. And, will surely review this board and share from my blog. Great tool to manage all the social activities. Thanks for sharing info. Can i share my website URL from socioboard on facebook? Yes, you can share it using compose message feature. Please try it and let us know if you’ve any issue. Really, Social media marketing is now compolsary and very very very important for any online or offline business and Socio board is great. It helps us to manage our multiple social media activities. Thanks for sharing. Keep posting on ShoutMeLoud. Thanks for reading and sharing your comment. And yes, Social Media Marketing is the heart of every organization today. Without social media marketing, it’s quite difficult or nearly impossible to win with your social strategy. 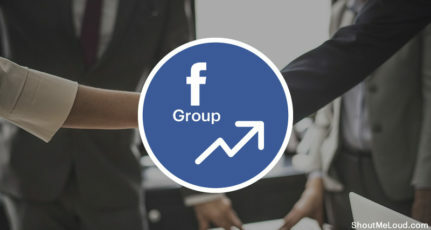 The main motive of Socioboard is to help the new startups and entrepreneurs whose social marketing campaigns failed to generate ROI and provide them a handy tool to manage their all social networks from a single platform without any hassle. @ANIL Thanks for the comment. Please try and share your experience with us. Hey Rupak, Thanks for the remark. Happy to hear that you enjoyed the post. If you don’t mind attempt Socioboard and impart your experience to us.